With the release of Chamberlain Waits two years ago, Scranton (Pennsylvania) based punk band the Menzingers seemed like they were winding down. It wasn't that the album was lousy. It was a breakthrough for the band and critically acclaimed (but not acclaimed as loudly as their debut), but didn't make enough money. They made up the difference by touring, until they got a call from someone else who heard merit in their work. Brett Gurewitz (Bad Religion) called them the kind of pure punk he grew up with and then signed them to Epitaph. It's easily one of the best band-label matches made last year. On The Impossible Past is storytelling punk. While some people will argue On The Impossible Past isn't their best album or that every album is equally strong, the Menzingers do bring something different to the table this time around. Their songwriting ability, storytelling, and diverse range all shine on the new album. Added to their own talents were Matt Allison (Alkaline Trio, the Lawrence Arms) and Justin Yates who produced it at Atlas Studios in Chicago. It's also safe to say touring with Against Me! and The Gaslight Anthem hasn't hurt either. There is a notable uptick in confidence, especially from vocalist/guitarist Greg Barnett. He is especially convincing when he leads off in a modestly controlled melodic verse before breaking in throat-cracking wails. Guitarist/vocalist Tom May, bassist Eric Keen, and drummer Joe Godino have all upped their game. And then there are a few unexpected moments on the album, like when this upcoming punk band drops down a pop song. Gates isn't my favorite cut, but the story is compelling as it references personal moments and places between Scranton and Lake Wallenpaupack. It's reminiscent of Barnett's own experiences, easily identifiable to anyone who grew up around there. But you don't have to be from there to get it. The song is gentle, but pained like many of the angrier songs on On The Impossible Past. Even on the opener, Good Things, which is lighter on lyrics and heavier on meaning, there is something more going on with this album. On the first pass, the song is easy to like but dismiss as another song about disconnecting from the American dream after failing a few times. But then later on the album, you hear a direct connection to the title track, shedding more light on the same story. The album is threaded together with relatable personal experiences. The muscle car that made him feel American in Good Things is the same one that gets wrecked in On The Impossible Past. And all those dreams of possibilities mentioned can be found in Nice Things, stuff that is within their grasp before it all becomes unrecoverable. Listen to the album again and it becomes pretty difficult to know where the story behind the story begins and where it ends or what songs stand alone and which belong to the bigger Midwestern portrait. This alone makes for a great case to own the album and not just a few cherry picked songs. While there is little doubt anyone who owns the album will love one song more than another, it's in its entirety that you'll find something specific, passionate, real, and felt. All the while, it might be the band's story to tell, but there are plenty of people who will listen to this album and relate, because they live or have lived something like this every day. The same can be said about the Menzingers. Their story is like that of dozens of bands who seem to emerge from nowhere (2006). But many have a deeper history. In this case, they really came together by combining Barnett from Kos Mos and May, Godino, and Keen from Bob And The Sagets. After a raving debut album with Go-Kart Records, they flipped over to Red Scare and a brief stint with Anti-Flag. But this album, more than any other, ensures much more is to come. 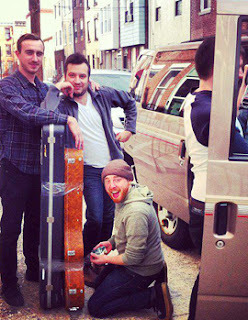 The Menzingers' On The Impossible Past Rivets 8.6 On The Liquid Hip Richter Scale. First-time listeners might note Barnett isn't as polished as some singers, but he makes up for it by owning his stories and delivering them with raw authenticity. Some songs certainly do outshine others on the 13-track album, but listing them out runs contrary to keeping the compilation together as it is meant to be. On The Impossible Past by the Menzingers can be picked up on iTunes. The album is also available on Amazon and you can find the CD at Barnes & Noble too. The band is currently heading out to Australia to play the Soundwave Festival. They will be back in March to kick off a tour that will play mostly in the Midwest and Pacific Northwest through April. Find the full schedule on Facebook.